Archbishop of Sebastia of the Greek Orthodox Patriarchate of al-Quds [Jerusalem] Atallah Hanna has affirmed that Palestinian people will continue to defend al-Quds [Jerusalem], their shrines and their just national cause no matter how tough the oppressive occupation policies are. His Eminence’s remark was made during a tour in Salwan town [ located in the south of al-Aqsa Mosque], which is being constantly targeted by Israeli occupation authorities. “Our mission is a message of solidarity, love, fraternity and national unity among all Palestinian people. The pains of Salwan citizens are our pains because we are one Palestinian people wherever and whenever we are, and we share the same ambitions,” the archbishop said, according to a newsletter sent to the Syria Times e-newspaper. His Eminence asserted that the issue of detainees and prisoners must be a top priority for Palestinians because those are the heroes and symbols of freedom and they deserve to stand by them. “We believe in values of human brotherhood and national unity through which we can be strong in defending the right we call for…Palestinians are not guests or a minority of al-Quds population…Al-Quds is their capital… We hope that internal Palestinian divisions will end so as to be strong in defending al-Quds and our shrines,” the archbishop stated, according to another newsletter sent by the archbishop Office. His Eminence has told a German media delegation that the Palestinian cause plus the attempts of aborting it are being marginalized by media outlets. “The world must show interest in the catastrophic circumstances the Palestinian children are going through… Gaza strip has become the largest prison in the world due to the siege being imposed by Zionist occupation,” the archbishop said. In a separate meeting with Swiss lawyers, his Eminence called for lifting the siege being imposed by Israel on Gaza strip as Palestinian people suffer from a real humanitarian catastrophe. “Occupation authorities have killed many youths and children during peaceful marches, and these crimes have been perpetrated because Israel, which acts brutally and without moral and human deterrent, has not been held accountable,” the archbishop clarified, indicating that over 2 million Palestinian persons are living under the siege in the strip. Add to that, His Eminence referred to the great efforts being exerted by the World Campaign for defending Children in Palestine, warning against forced displacement being practiced by occupation authority. “Forced displacement is dangerous and poses a threat to scores of Palestinian families and the UN report must take this matter seriously,” the archbishop asserted, calling for active European role in protecting al-Quds city’s history from Zionist occupations’ attempts to change it. His Eminence regrets that some Arab countries have decided to be involved in the plot that aims to eliminate the Palestinian cause. 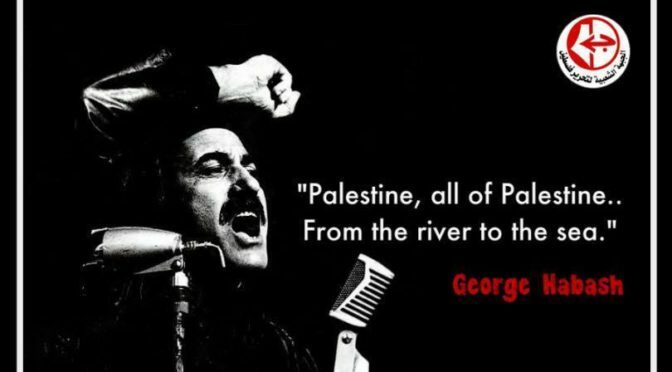 “If those who normalize relations with Israel believe that Israel can keep them in power, they are mistaken as the top priority for Israel is its interest and the continuity of its occupation of Palestine. While those who believe that they are US friends, they will discover- sooner or later- that they have no friends because Washington just thinks of its agendas and it has thirst for gulf oil, which it steals from our region to finance its wars and policies,” the archbishop concluded. 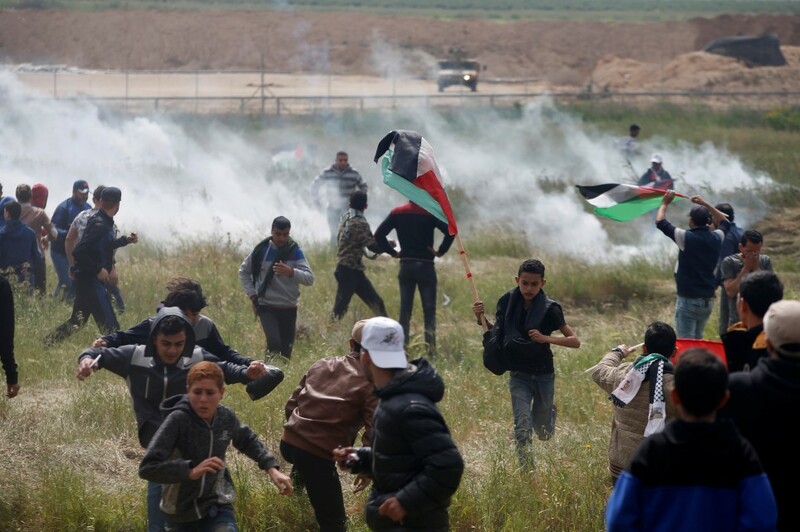 The Zionist occupation forces Friday fired live bullets and gas bombs while attacking the Return Protests on Gaza border, injuring or suffocating dozens of Palestinians. After Friday Prayers, Gazans started flocking into the Strip’s order to protest the Zionist blockade and demand the return to their occupied lands. Zionist sources mentioned that the Israeli military command authorized the enemy soldiers to fire live bullets at the upper part of the protestors’ bodies and warned them from being exposed to sniping operations. It is worth noting that the National Committee of the Return Marches called for wide participation in the weekly protests which have been held for 47 consecutive weeks. The world is fixated by the forest fires in Hollywood burning down stars’ mansions. With supreme irony some of them belong to those who helped raise millions of dollars for the Israeli Army which is now burning the hovels of Gaza. Europe’s Human Rights Exposed in Treating Refugees: Families Fed ’Like Animals in Pen’! Disturbing footage emerged Friday of the way migrants are being treated inside Hungary’s main refugee camp on the border with Serbia, with images showing families fed “like animals in a pen”. Many migrants too far back in the crowd climbed onto the fence, waving and shouting to get the officers’ attention. “It was like animals being fed in a pen, like Guantanamo in Europe,” said Klaus Kufner, a volunteer who was with the woman who recorded the images, referring to the notorious prison camp where the US is accused of torturing inmates. He stated that he and Michaela Spritzendorfer — who filmed the scenes — had driven together to Roszke to bring food, clothes and medication to help the thousands of refugees pouring over the border. “It was inhumane and it really speaks for these people that they didn’t fight over the food despite being clearly very hungry,” said Spritzendorfer, the wife of a Vienna councilor with Austria’s Green Party. The UN’s refugee agency criticized the dire conditions at the Roszke camp earlier this week, with Hungary’s hardline stance against migrants also angering other EU countries. Hungary’s right-wing government in late August completed a razor-wire barrier along its 175-kilometer border with Serbia but it is not proving to be much of an obstacle for desperate people fleeing war in Syria and Iraq. Prime Minister Viktor Orban has however ordered the building of an additional four-meter high fence that he wants completed by the end of October. Filed under: Europe, Human Rights, Humanitarian Crimes, Humanitarian crisis | Tagged: Concentration camps |	Comments Off on Europe’s Human Rights Exposed in Treating Refugees: Families Fed ’Like Animals in Pen’!